Let’s say someone wants to order something that we don’t regularly carry in the database. Maybe it’s a statue, maybe it’s a t-shirt, or maybe it’s just a variant cover. This is where Special Orders come in handy. They can place a special order for an item, and when it comes in, you can invoice it. It’s that simple! Your customers can request a special product by clicking on the “Request a Special Order” button. 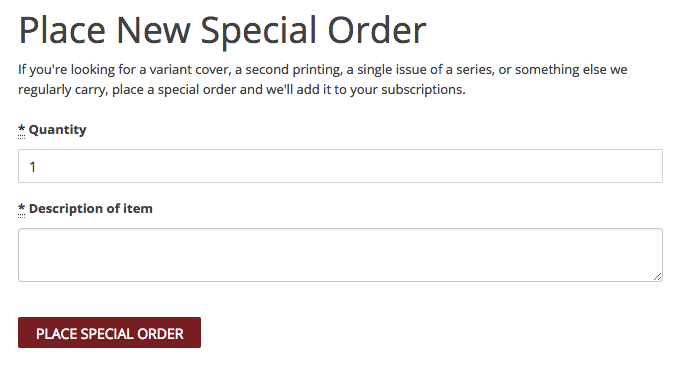 All of their current special orders will show under their subscriptions. Once they make their request, you will get a notification saying that there are new special orders to be processed. Special Orders can also be seen on a Customer List. When a Special Order comes in, you’ll need to process it so that you can properly pull it later. Click on the “Special Orders” link in the Orders menu. Special Orders have three statuses, Pending, Placed, and Pulled. A Pending Special Order has been placed by a customer, but still needs to be confirmed, and ordered by you before it will show up in their Special Orders section. Simply click the “Process Order” button to get started. Here you can choose the product type, add a description (the title of the product), a Price (in USD), and the Discount you want to apply to it (if any). Click “Update Special Order” and that order is now Placed. Placed special orders can be pulled. This happens just like pulling your regular orders, and the link can be found under Pull Lists (right below Pull Customer Orders). 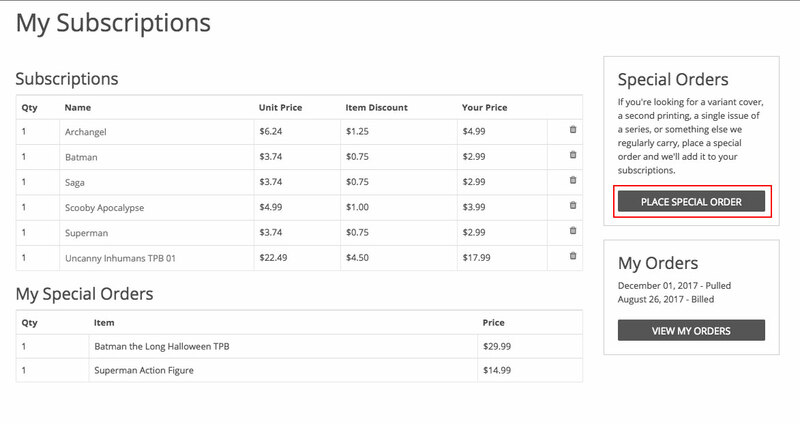 It works the same as your regular pulls, check mark next to the title, adjust the price, and click Pull. Confirm your orders and make sure they look good. Pulled Special Orders appear in your Pulls by Date report.